Attach to the active location. Attached location gets +1 quest point. Response: After attached location leaves play as an explored location, the first player puts 1 ally into play from his hand. Attach to a Hobbit hero. Limit 1 per hero. Attached hero gets +2 Defense while defending against an attack by an enemy with an engagement cost higher than your threat. Action: Each hero you control gets +1 Willpower until the end of the round. Draw 1 card for each Hobbit hero you control. 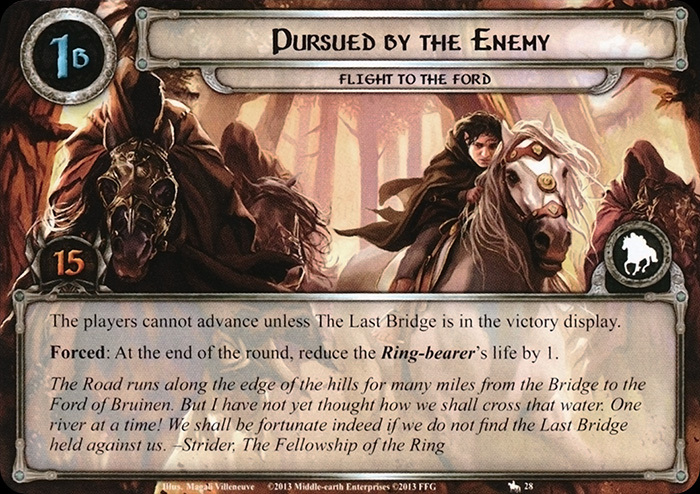 Response: Spend 1 Fellowship resource and exhaust The One Ring to cancel the effect of an encounter card just revealed from the encounter deck. Shuffle that card back into the encounter deck and reveal another encounter card. 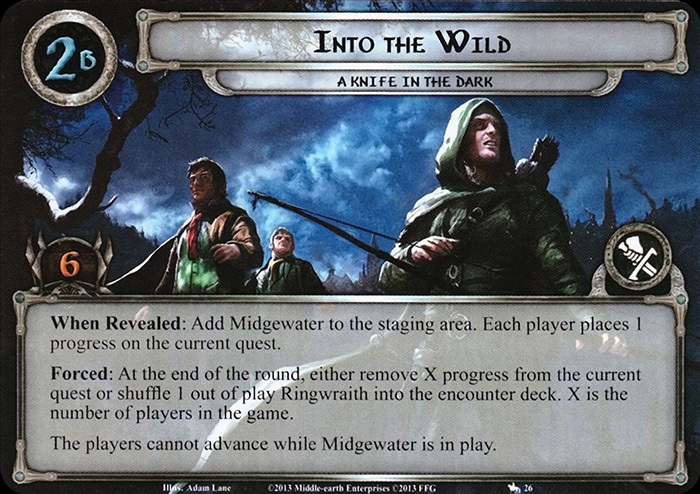 Lower the cost play Take No Notice by 1 for each Hobbit or Ranger hero you control. Action: Add 5 to each enemy's engagement cost until the end of the round. Setup: Set Buckleberry Ferry aside, out of play. 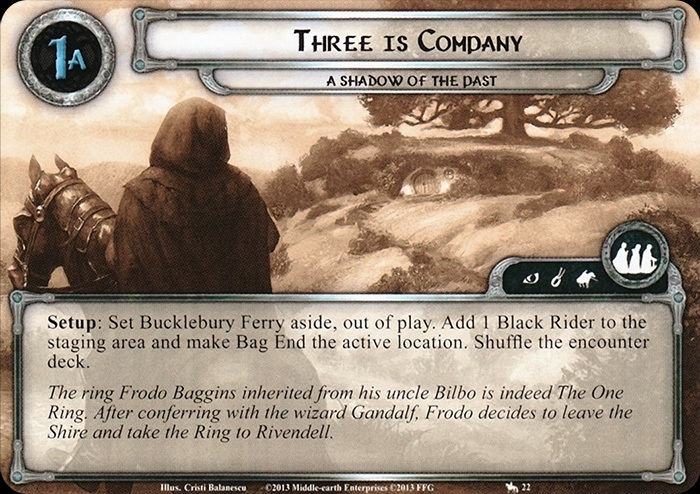 Add 1 Black Rider to the staging area and make Bag End the active location. Shuffle the encounter deck. When a player fails a Hide test, each Nazgûl enemy in the staging area engages that player. (Trigger Forced effects after resolving this effect.) The player cannot advance unless Bag End is in the victory display. When Revealed: Add Buckleberry Ferry to the staging area. 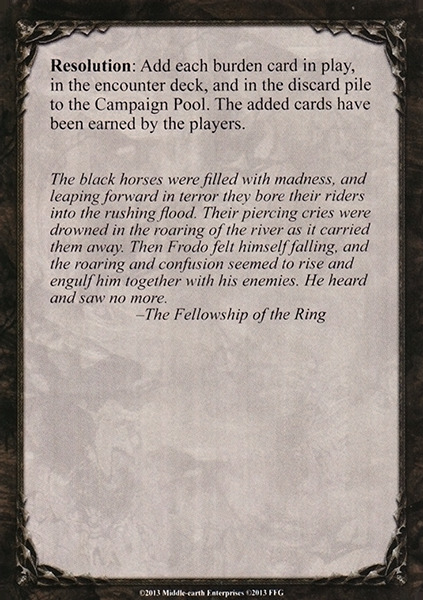 When Revealed: The first player searches the encounter deck and discard pile for a Black Rider, reveals it (cannot be canceled), and adds it to the staging area. Shuffle the encounter deck. When a player fails a Hide test, each Nazgûl enemy in the staging area engages that player. (Trigger Forced effects after resolving this effect.) Response: After a player makes a successful Hide test, place X progress on a non-unique location in play. X is twice the number of players in the game. Setup: Set all copies of Ringwraith, The Witch-king, Midgewater, and Weathertop aside, out of play. Add The Prancing Pony and Bill Ferny to the staging area. Shuffle the encounter deck. 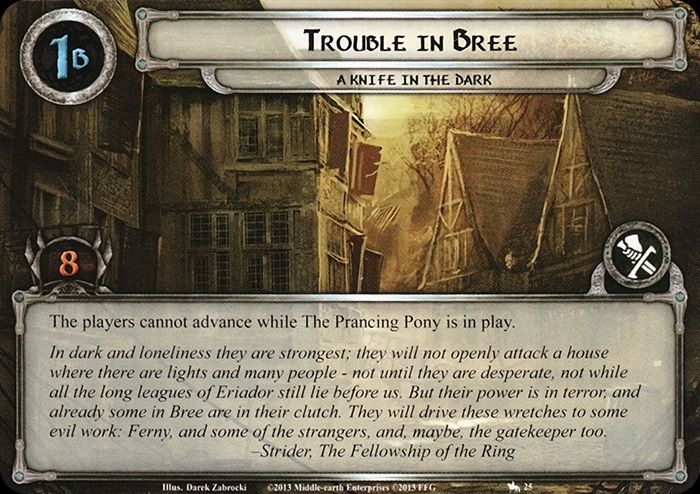 The player cannot advance while The Prancy Pony is in play. When Revealed: Add Midgewater to the staging area. Each player places 1 progress on the current quest. Forced: At the end of the round, eithe remove X progress from the current quest or shuffle 1 out of play Ringwraith into the encounter deck. X is the number of players in the game. The players cannot advance while Midgewater is in play. Setup: Shuffle each burden card from the Flight to the Ford burden set into a Burden deck. Attach An Evil Wound to the Ring-bearer. Set Ford of Bruinen and The Witch-king aside, out of play. Add The Last Bridge and 1 Fell Rider per player to the staging area. Set the Ring-bearer's life at 15. Shuffle the encounter deck. The players cannot advance unless The Last Bridge is in the victory display. Forced: At the end of the round, reduce the Ring-bearer's life by 1. When Revealed: Add Ford of Bruinen and The Witch-king to the staging area. 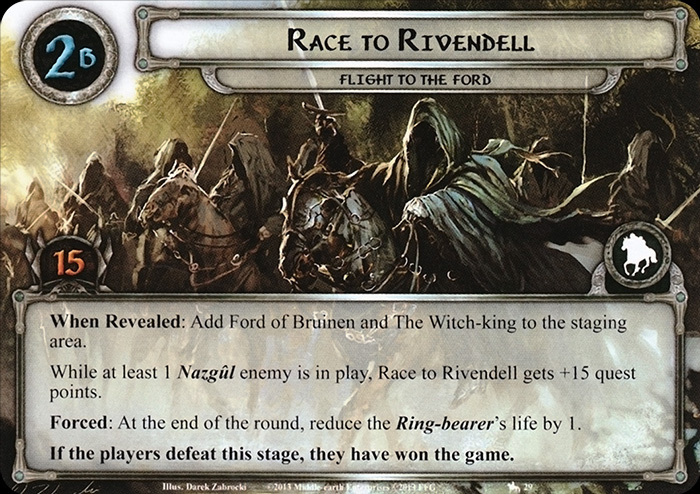 While at least 1 Nazgûl enemy is in play, Race to Rivendell gets +15 quest points. Forced: At the end of the round, reduce the Ring-bearer's life by 1. If the players defeat this stage, they have won the game. You are playing Campaign Mode. Setup: Attach Mr. Underhill to the Ring-bearer. Add Gandalf's Delay to the staging area. 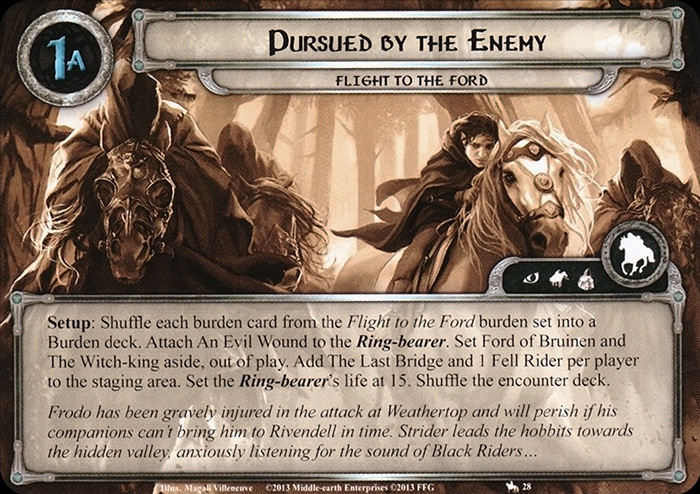 Shuffle Gildor Inglorion and The Ring Draws Them into the encounter deck. 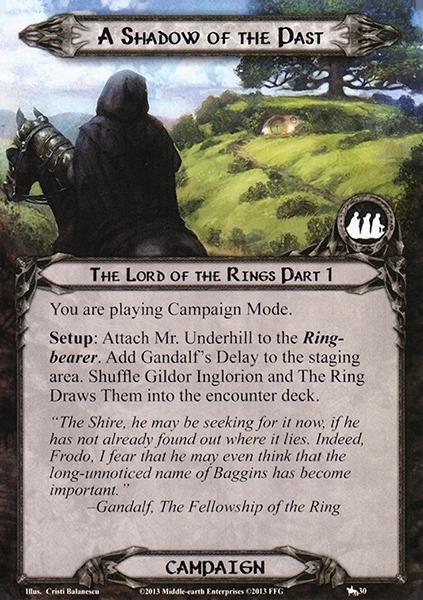 Resolution: Choose Gandalf's Delay or The Ring Draws Them and add it to the Campaign Pool. Then, choose Gildor Inglorion or Mr. Underhill and add it to the Campaign Pool. The chosen cards have been earned by the players. 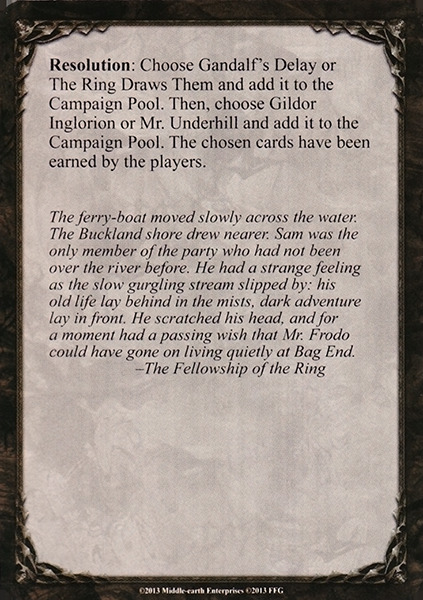 Response: After Bag End leaves play, each player draws 1 card for each Hobbit hero he controls. Immune to player card effects. While there is at least 1 other location in play, players cannot travel here. Travel: The first player must make a Hide 3 test to travel here. 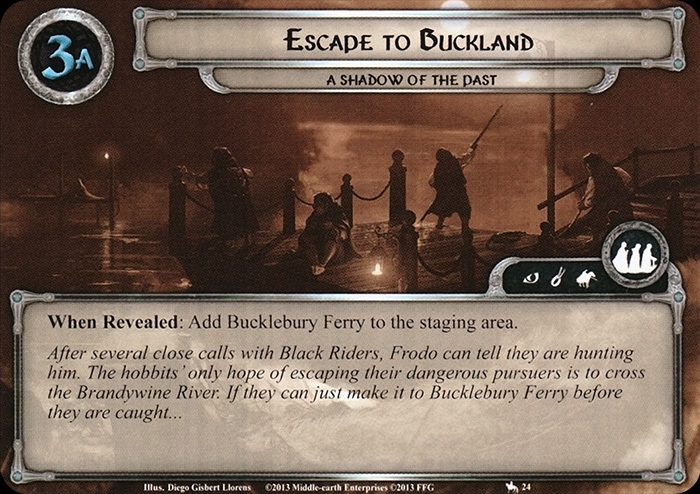 After Bucklebury Ferry leaves play as an explored location, the players win the game. While Stock Road is in the staging area, add 2 to the total Threat of the discarded cards when a player resolves a Hide test. Travel: The first player must make a Hide 1 test to travel here. 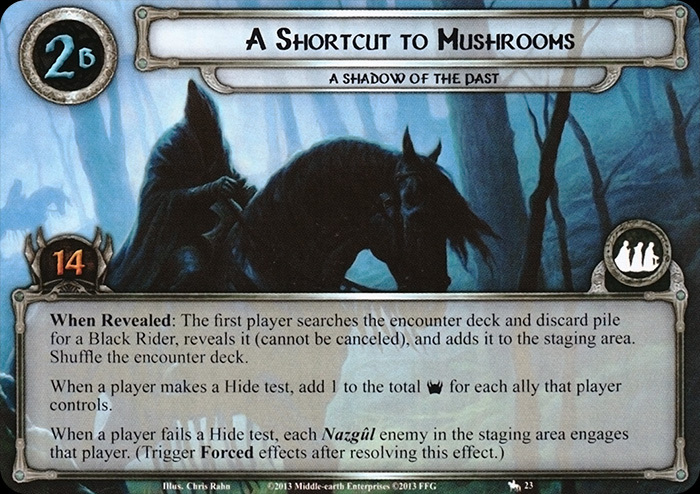 Forced: After a player fails a Hide test, shuffle a Nazgûl enemy from the discard pile into the encounter deck, if able. Shadow: Attacking enemy gets +1 Attack (+2 Attack instead if the defending player failed a Hide test this round). While Evil Crow is engaged with a player, that player adds 1 to the Hide value for each Hide test he makes. When Revealed: If you have failed a Hide test this phase, remove each character you control from the quest. 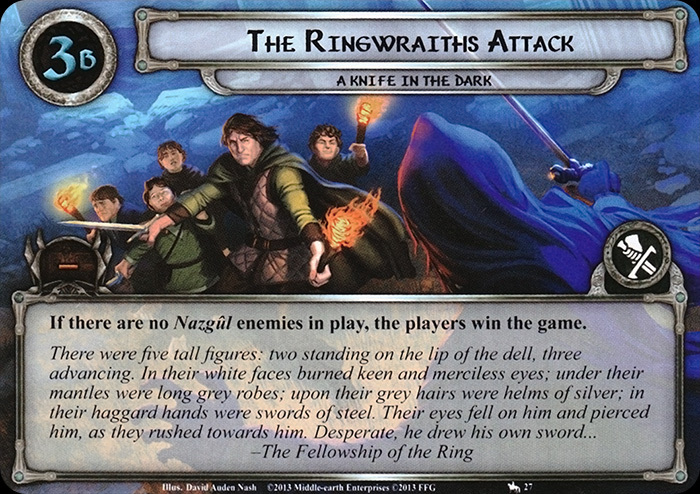 When Revealed: Starting with the last player, each player must either return a Nazgûl enemy engaged with him to the staging area or make a Hide 2 test. You are playing Campaign Mode. Resolution: Starting with the first player, each player may choose one of the following boon cards and attach it to a hero he controls: Tireless Ranger, Skilled Healer, Valiant Warrior, Noble Hero. The chosen cards have been earned by the players. Response: After players travel here, the first player puts 1 ally into play from his hand. Forced: After The Prancing Pony leaves play, discard cards from the top of the encounter deck until X enemies have been discarded. X is the number of players in the game. Put each enemy discarded by this effect into play engaged with the first player. Immune to player card effects. While Weathertop is in the victory display, each enemy in play gets -1 Threat. Travel: The first player must exhaust The One Ring to travel here. While Midgewater is the active location, enemies cannot attack, take damage, or be engaged. Forced: After Midgewater becomes the active location, return each engaged enemy in play to the staging area. Players cannot optionally engage Bill Ferny. 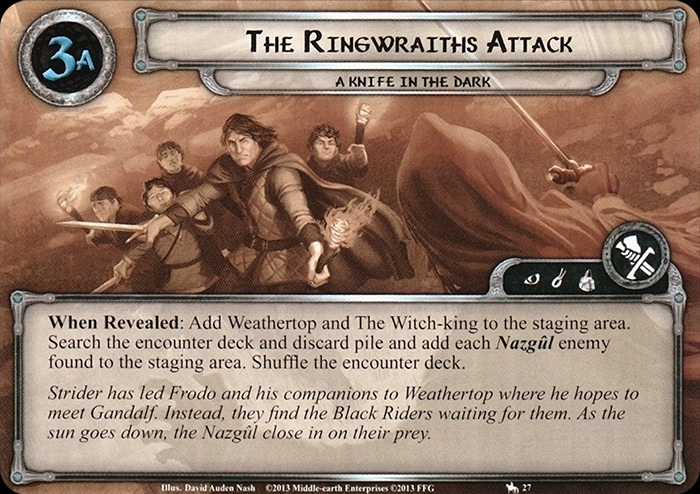 Forced: At the beginning of the staging step, either shuffle 1 out of play Ringwraith into the encounter deck or each player raises their threat by 1 for each non-Fellowship hero he committed to the quest. 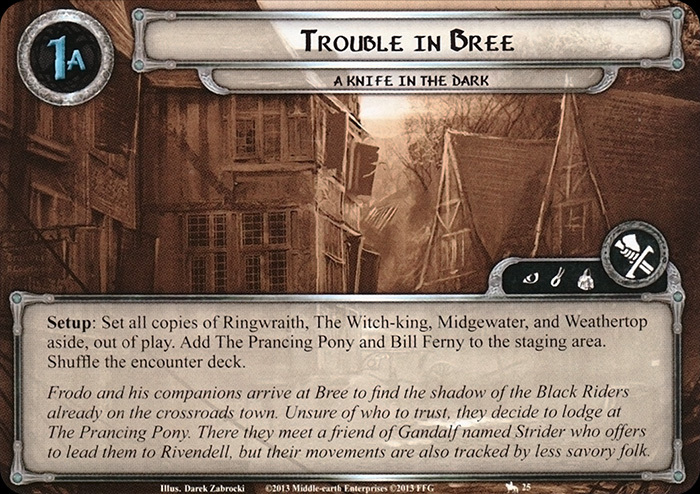 While The One Ring is exhausted, Shady Bree-lander gains: "Cannot be optionally engaged." Shadow: Defending character get -1 Defense (-2 Defense instead if The One Ring is exhausted). When Revealed: You must either shuffle an out of play Ringwraith into the encounter deck or reveal an additional encounter card. When Revealed: You must either remove 2 heroes you control from the quest or shuffle an out of play Ringwraith into the encounter deck. Resolution: Add each burder card in play, in the encounter deck, and in the discard pile to the Campaign Pool. The added cards have been earned by the players. Attach to the Ring-bearer. Attached hero cannot be healed. When attached hero would take any amount of damage, reduce the Ring-bearer's life by an equal amount instead. If the Ring-bearer's life reaches zero, the players lose the game. Immune to player card effects. X is the number of players in the game. Travel: The first player must reveal the top card of the burden deck and resolve that card as if it were just revealed from the encounter deck to travel here. Immune to player card effects. 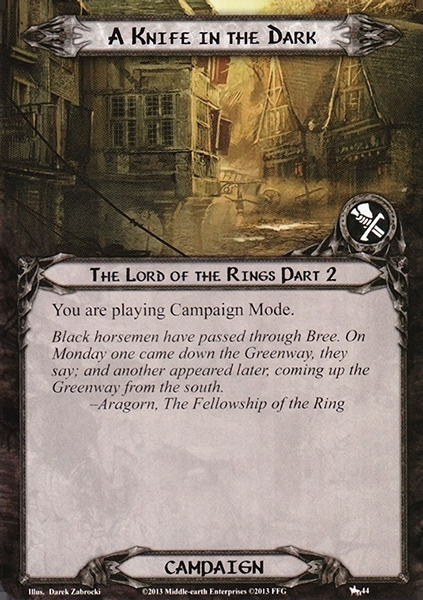 Response: After Ford of Bruinen leaves play as an explored location, all engaged enemies are discarded. Travel: The first player must reveal the top card of the encounter deck to travel here. When Revealed: You must either shuffle the top card of the burden deck into the encounter deck and reveal an additional encounter card, or raise each player's threat by 3 and immediately end the quest phase (do not resolve the quest). The Enemy is Upon Us! When Revealed: Reduce the Ring-bearer's life by 1. Then, reduce the Ring-bearer's Willpower, Attack, and Defense to 0 until the end of the round. Shadow: If this attack destroys a character, reduce the Ring-bearer's life by 1. When Revealed: Treat the text box of each character in play as blank (except for Traits) until the end of the round. If there is a Nazgûl enemy in the staging area, The Nine are Abroad gains surge. When Revealed: Each ally gets -1 Willpower until the end of the round. Deal 2 damage to each ally with 0 willpower. 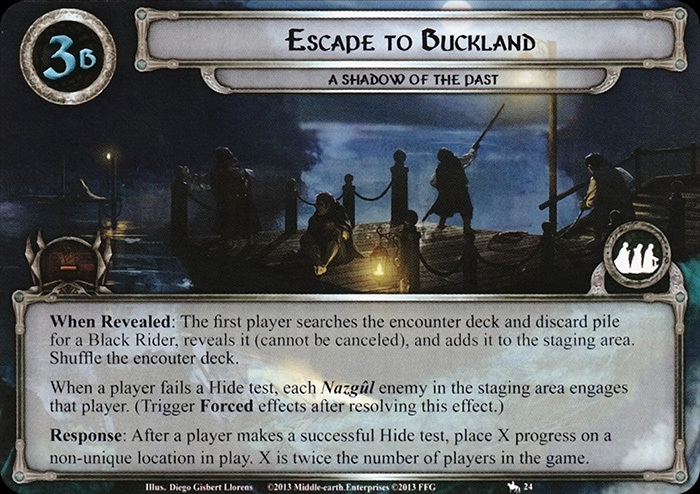 When Revealed: Search the encounter deck and discard pile for a Nazgûl enemy. Either add it to the staging area or put it into play engaged with the first player. Shuffle the encounter deck. When Revealed: Return each engaged Nazgûl enemy to the staging area. If no enemies were returned to the staging area by this effect, Rode Like a Gale gains surge. 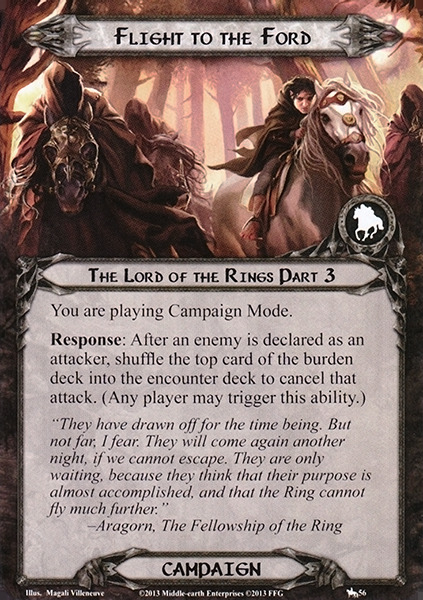 When Revealed: The first player must either exhaust The One Ring or raise his threat 3. The first player gains control of Gildor Inglorion. Forced: At the end of the round, discard Gildor Inglorion. 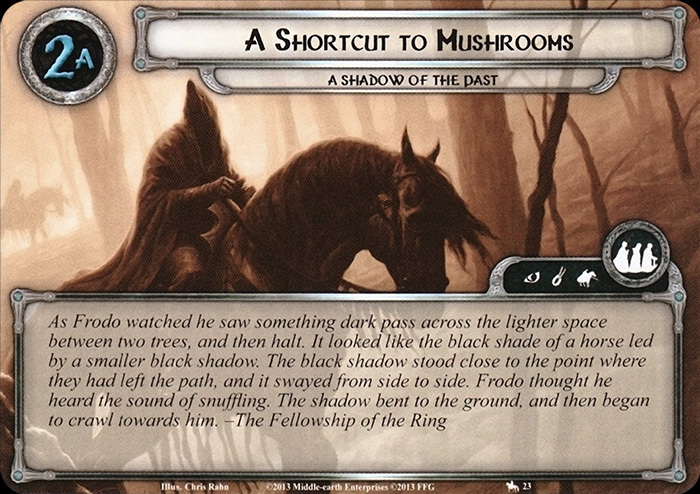 The first player may spend 1 Fellowship resource to cancel this effect. Setup: Add Gandalf's Delay to the staging area. Each player draws 1 less card in his starting hand. When Revealed: At the end of the phase, each enemy in the staging area engages the first player. If the One Ring is exhausted, this effect cannot be canceled. Defending player raises his threat by 3. When Revealed: The first player must deal X damage divided among heroes he controls where X is the number of players in the game. When Revealed: The first player raises his threat by 3 and passes the first player token to the next player. 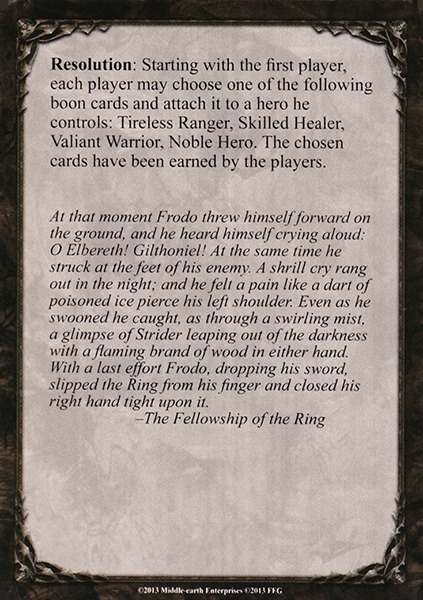 When Revealed: The first player must exhaust The One Ring. 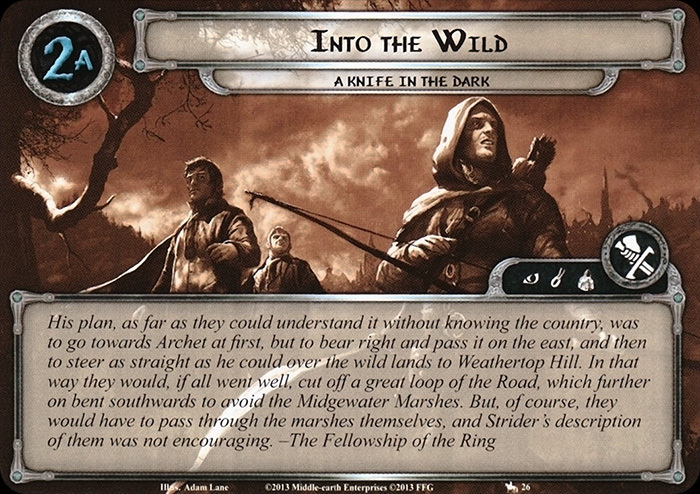 If The One Ring is already exhausted, the first player must discard 2 cards at random from his hand. Shadow: Defending player discards 1 card at random from his hand.